Objective journalism is a modern concept. Through the end of the nineteenth century and into the early years of the twentieth, subjective newspapers were the norm, typically assuming the attitude of the publisher, editor, or printer, roles that often met in the same person. 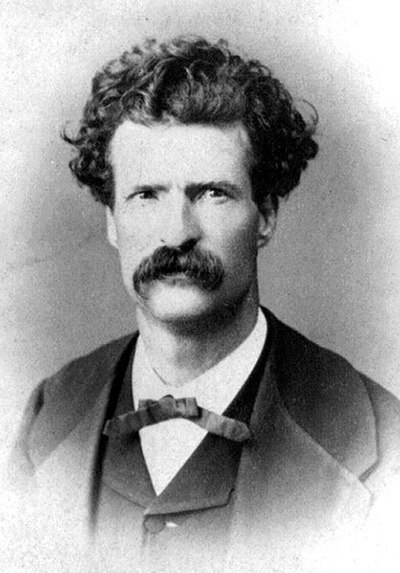 Samuel L. Clemens (early writing as W. Epaminondas Adrastus Blab before adopting the pseudonym Mark Twain), began as a tramp printer, soon reporter for a handful of newspapers, and knew the species well. In Journalism in Tennessee, a story he wrote (as Mark Twain) while editor for the Buffalo Express, September 4, 1869, he satirically relates an apocryphal sojourn with the Morning Glory and Johnson County War-Whoop, a paper run by a Chief Editor who knew a thing or two about the realities of journalism. "The editors of the Semi-Weekly Earthquake evidently labor under a misapprehension with regard to the Dallyhack railroad…"
To which the editor responded, "Thunder and lightning! Do you suppose I am going to speak of those cattle that way? Do you suppose my subscribers are going to stand such gruel as that? Give me the pen!" "The inveterate liars of the Semi-Weekly Earthquake are evidently endeavoring to palm off upon a noble and chivalrous people another of their vile and brutal falsehoods with regard to that most glorious conception of the nineteenth century, the Ballyhack railroad…"
In addition to the Morning Glory and Johnson County War-Whoop, and Semi-Weekly Earthquake, Twain, in this story, also cites the apocryphal Moral Volcano, Mud Springs Morning Howl, Higginsville Thunderbolt and Battle Cry of Freedom, and the Daily Hurrah. Journalism in Tennessee was recently reprinted in a new book I cannot say enough good things about, Typographical Tourists, which we recently reviewed. The typographical device is courtesy of Poltroon Press, with our thanks. Readers are invited to submit their own apocryphal newspaper names in the Comments section. An informative article that was ignored by the editors of the Mariposa Newspacket, Commercial and Financial Undertone and Plutorian Citizen and Home Advocate. Thank God for the internet (and Stephen Leacock). The Sunday Moral Hazard reports that Twain wrote many pieces (column inches) in San Francisco and Nevada City which have not survived -- until some fearless book scout finds and recognizes them in a newspaper lining an old trunk.